The New England Patriots won their fifth Super Bowl with their historic overtime win over the Atlanta Falcons. The Pats completed the biggest comeback in Super Bowl history with their 34–28 win over the Falcons after going down 28–3 to start the game. 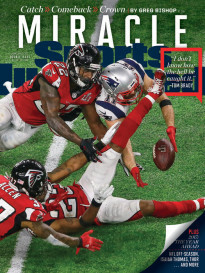 Tom Brady was named Super Bowl MVP, but Julian Edelman's fourth quarter catch was one of the most-played highlights of the night and earned him a spot on Sports Illustrated's cover. 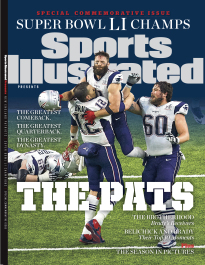 To purchase one of SI's Patriots issues, including any of the commemorative covers, see below. 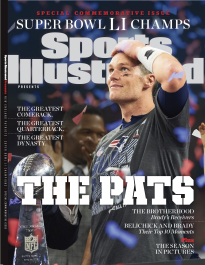 SI's Patriots championship package is also available for purchase. Featuring Tom Brady and Julian Edelman on the cover. Frames available in multiple colors. Featuring Willie McGinest on the cover. Brady has been one of the most features athletes on the cover of SI, with 20 covers. To view all of SI's past covers, click here.